You Asked ... I Told! | Travel Musings • Yummy Insights • Join me on my tasty journey! You Asked … I Told! Sprinkle yeast over water and stir to dissolve and let proof (sit until foamy). Add butter & honey to milk, stire and cool to lukewarm. In bowl, beat eggs slightly. Stir in proofed yeast, milk misture, lemon peel, salt and vanilla. Gradually beat in 1 & 3/4 C of the flour. Beat vigorously about 3 minutes (until you see bubbles of air caught within the dough – that’s a good sign!). Beat in another 3/4 C flour. The dough will be very gloopy at this point. Cover with a tea towel for about an hour in a warm place (or in the oven on PROOF mode). Stire down and turn out onto a floured surface. Mix with remaining 1/2 C flour. Knead gently, additional additional flour if necessary until smooth and pliable. Dough should ‘snap’ when kneaded and when squeezed should feel a little buttery but not sticky. Roll dough out 1/2″ thick on floured surface. Slather in melted butter, and sprinkle with cinnamon and sugar (to your liking). Roll and pinch at edges. 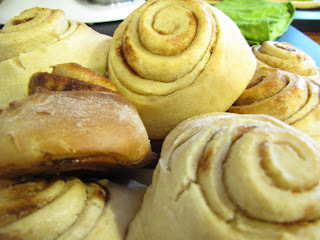 Slice in 1-1/2″ slices and place on baking sheet with 1″ between rolls. Cover with tea towel and let rise 20-30 minutes. Heat oven to 350 degrees and bake until perfectly golden brown. For more decadence: Mix 3T cream cheese, 1-2 cups powdered sugar and as much cream (or half-and-half) to make an icing consistence. Follow directions to create rolled buns (above). Prepare edged baking dish with 1/2 C melted butter covering the bottom, a layer of 1/2-3/4 cups of brown sugar, 1 cup of chopped or whole pecans, and a drizzling of Karo corn syrup. Place uncooked rolls atop sugar/nuts approx. 1″ apart. Bake at 350 until bottom has carmelized and buns are golden brown. Immemdiately flip (taking care for results of molten carmel on skin) onto serving platter and enjoy. Yes – you can even add a pat of butter to each for more decadence! One Response to "You Asked … I Told!" Thanks for putting it up! I know what we’re doing next weekend!